Leading to the 2000 Sydney Olympic Games: Germany and Holland, the later to a lesser extent, had mastered the strategies and pattern of plays to circulate the ball in the back effectively. The other competing countries were a step or two behind and were playing a catch up game during this era. On top of this, these two nations, in addition to the Australians had also mastered the art of the various types of Press Tactics. Fast forwarding 17 years, now the core theme of the Pre match meetings to design a strategic game plan against the opponents is more or less zoomed upon these above mentioned topics and set plays. 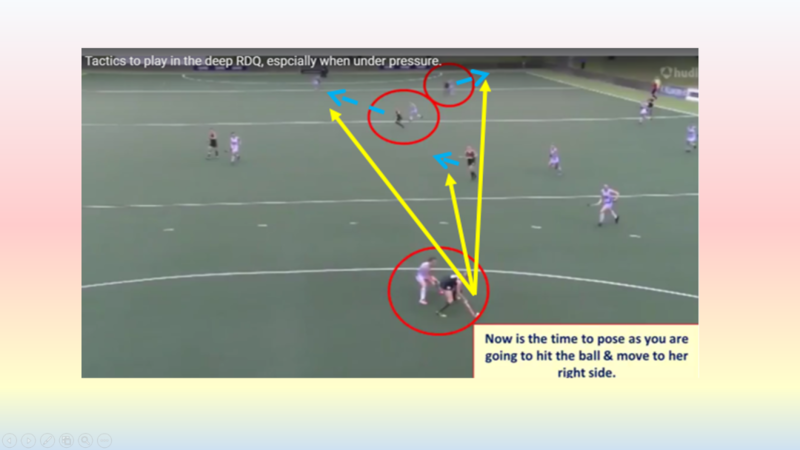 We have come a long way: It was apparent, during the 2016 Rio Olympic Games, how most of the teams had mastered the strategies and tactics of circulating the ball in the back. On top of this, how and when to Press as a team to counter them. There was one missing link – of which most of the top coaches are unaware of - which is the key theme of this CNL #5 issue. 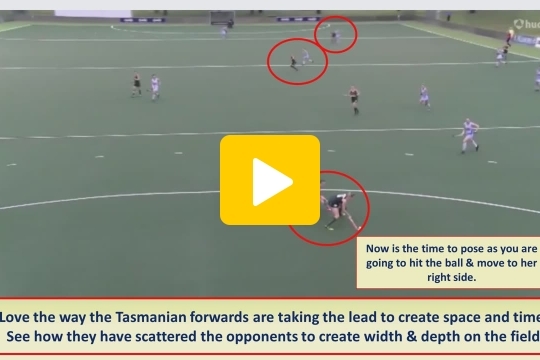 How to develop the fine art of ball control, footwork, deceptive hits and mild intimidation tactics, to escape the claws of the opponents press tactics, successfully. According to Derrek Pappas, knowledgeable and passionate hockey coach & teacher, “Junior players are fascinated by the drag flick to the point that they do not learn the basics such as hitting and dribbling. There are only 1-3 drag flickers on a team. Junior coaches tell me about is that players who are not drag flickers are playing with drag flicking sticks or sticks with extreme bends. 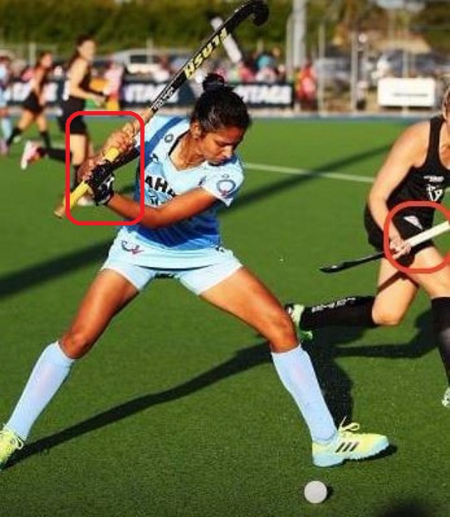 It is not possible to hit the ball correctly with a drag flicking stick. It is also difficult to dribble the ball”. It would be nice, if coaches and players would now, start spending more preparation time upon offensive creative tactical plays, while utilizing the soft skills, in the opponents third quarter. Rather than, employing “Hit and Hope Tactics” and looking for deflections. I am deeply concerned as this is not hockey at its best. And neither the wisest step in the right direction. Please Think about it. And bring a positive change. Derek Pappas, also analyzed and commented on the Indian Women’s national team player’s hitting technique. “I don't like to pick on individual players. This is directed at this player's coach. Let’s analyze the hit in the picture below. What simple things could the player do differently in order to have a more consistent hit that under pressure will deliver the ball on target, on the ground, without spin”. Put both hands together with the v formed by the thumb and forefinger pointing to the right chin. Naked Fact: After referring to the above examples and observing the top international players in action, it is apparent that “we as coaches have not developed the fine art and science of hitting the ball smoothly and accurately” in the current generation of hockey players. To add insult to injury, we are neither doing so - teaching - with the current and future generation of players, who are in their pre-teen and early teen years. This is a blunder. Now is the time to bring this positive change. 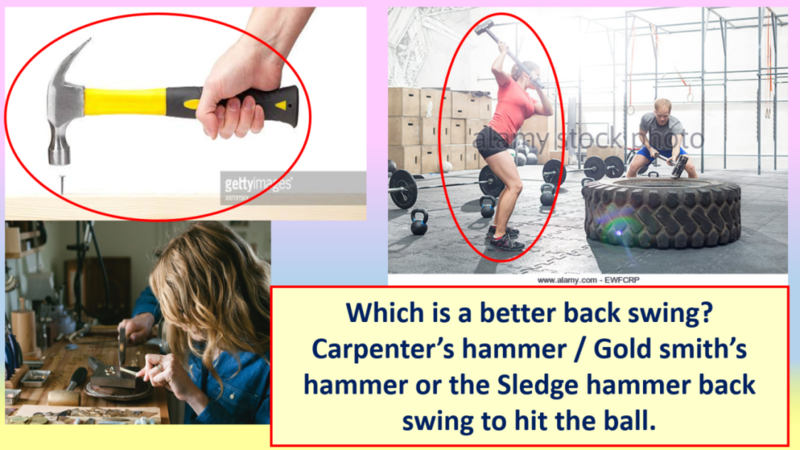 The secret is not in the brute force, but in the settled correct technique of executing a hit, which has been described in the videos included in this CNL #5. Avoid striking the ball with a sledge hammer back swing; use the precision of a goldsmith’s controlled swing. Please see the photo below. Please view this PowerPoint Presentation to see more examples. Avoid – Unnecessary- running with the ball towards the opponent forward with speed, who is putting pressure. Why jump in to the hungry roaring lions open mouth. Why go with the ball to the person who has come to steal it from you, in your own defensive quadrant. The strategy and mind set has to be different. Saying to yourself, I have the ball and I am in no rush to just throw it away, resulting in a turnover. Or dribbling directly into the opponent. Let them come and make the first move. Self-talk should be … It is my ball and nobody can steal it from me. An example from the 2017 AHL league, where the deep defender runs with the ball to the opponents, who are implementing a press, resulting in a Turnover and a goal. The secret for this is, as the whole body stays balanced till the hit skill is executed. Whereas if you are stepping into the ball, it is a bit harder and awkward to achieve the above variations. Please refer to Coach Shiv’s home made video, regarding the training methods. It covers the technical and tactical aspects of the topic. No harm viewing the following video link from the CNL #4 again. Repetition is the mother of learning. Here are some steps – Do’s & Don’ts - to keep in mind, while training. Remember Higher the risk, higher the rewards. Take calculated risk. Encourage the players to be cool, calm and confident under pressure. And think of the rewards and not the penalties. As when one escapes from the claws of the press, there is ample space in the opponents ROQ and LOQ. A frozen game situation below from the 2017 AHL photo video depicts the opportunities. See arrows in yellow. First develop these skills in isolation, training in specific game situation, so the players know when and where to apply them. Please refer to the training video. Studies have indicated that; the ability to manage one’s emotions and remain cool, calm and confident under pressure has a direct link to one’s performance. Remember; The pressure is not in the situation, but how one perceives the situation. Please Note: It is easier said than done. To be perfectly honest, I have been trying to do so, for many decades but have not been successful. No surprise, I have not been able to achieve, what I was capable of and could have. But, It is never late. Keep trying and never ever give up. Winners never quit and quitters never win. Coach Shiv is in the process of exploring opportunities in the far east, to collaborate with the Sports Goods manufacturing companies. And provide directly no name sports equipment at a lower price, for the interested clubs and state associations, who are subscribing this CN. Why pay more for a brand name? Especially for the beginner hockey players? More details to follow soon.